Now that 2016 is here, we're starting to see some of the latest crop of 2016 NASes from Synology. We last reviewed the Synology DS216 2-bay NAS targeted to the value conscious consumer. This review covers Synology's DS716+ Disk Station. The table below positions the DS716+ in Synology's small business focused plus series. 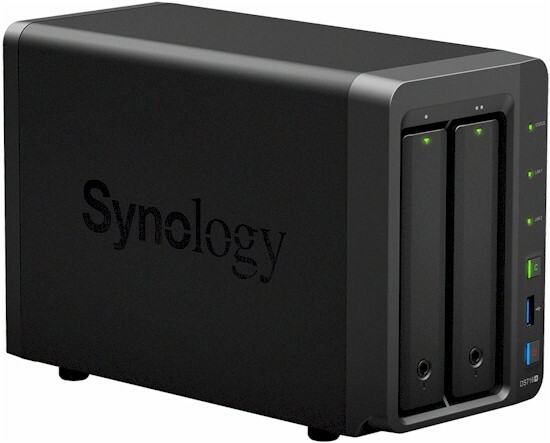 The DS716+ replaces the DS713+ as Synology's most expensive two-bay NAS. Like the DS713+, the DS716+ is a two-bay NAS, but expandable to a total of seven bays with addition of the optional eSATA-connected DX513 expansion cabinet. The DS716+ has its own Quick Installation Guide that includes step-by-step instructions for mounting disks into tool-less disk trays, connecting the DS716+ to power and LAN and configuring the NAS. The Quick Installation Guide also includes front and rear panel callouts, shown below, as well as an LED Indicator Table found in Appendix B. Unlike the DS713+, the DS716+'s board was difficult to remove. The image below shows the main PCB. There's a single memory slot containing a 2 GB DDR3 SoDIMM. But there's a warning seal declaring your warranty void if you remove the memory. Compared to the DS713+, the DS716+ features a beefier Intel quad-core Celeron and double the amount of RAM. The table below summarizes the key components of the DS713+, DS716+ and two recently-reviewed similar products from ASUSTOR. The ASUSTOR AS6202T provides the most direct comparison because it uses the same processor. Note, however, the ASUSTOR comes with 4 GB of RAM that's expandable to 8 GB total. The ASUSTOR, however, doesn't support an expansion cabinet. With two drives, the DS716+ drew 19 W with WD Red 1 TB (WD10EFRX) drives spun up and 10 W with the drives spun down for power save. Noise was rated as low. RAID 1 rebuild was immediate when the bad block check option was skipped.